Rooms at the Oakland Marriott City Center are no longer available. Several hotels in the immediate vicinity have vacancies, and we encourage you to explore these options as soon as possible. The Courtyard Marriott and the Washington Inn are both directly across the street from the conference venue, and the Clarion Hotel is approximately three blocks away. Overnight accommodations are not included in the conference registration fee. Meals are not included with hotel reservation. Continental breakfast service will be provided in the Marketplace from April 21-23 for registered Three-Day Conference attendees. Psychedelic Science 2017 is taking place at the newly renovated Oakland Marriott City Center and the adjacent Oakland Convention Center. Exit airport. Take Hegenberger Rd to I-880 N. Exit Broadway and turn right. Go 3 blocks, turn left on 10th St. Make right turns around the block to hotel entrance. Take 101 North. Merge to I-80. Take 580 East off the bridge to 980 S. Take 11th/12th St. exit. Go 1 block, turn left. Hotel is at 11th & Broadway. Self and valet parking includes in/out privileges for overnight hotel guests. For valet, a $10 late fee applies after 3pm. There are ample additional street and private parking facilities in the area (be mindful of early closures). 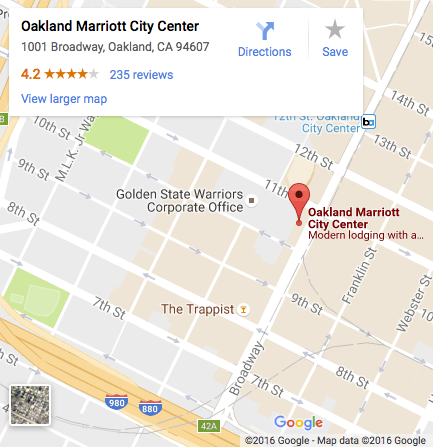 The Oakland Marriott City Center is conveniently located 0.1 miles from the 12th St./Oakland City Center Bay Area Rapid Transit (BART) station. The hotel is also 2 miles from both the bus (Greyhound) and train (Amtrak) stations.